Wax nostalgic about and learn from the history of early electronics. 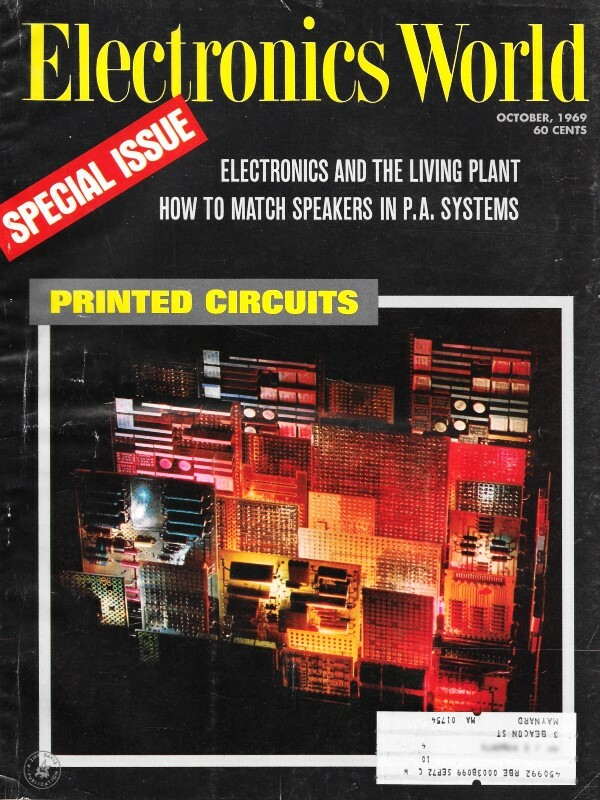 See articles from Electronics World, published May 1959 - December 1971. All copyrights hereby acknowledged. During my tenure in the early-to-mid 1980s as an electronics technician at Westinghouse Electric's Oceanic Division, in Annapolis, Maryland, I assembled many a Mil-Spec printed circuit board. An initial week-long soldering class and then periodic refreshers were required to get NASA-certified for the type of critical work we did there. I have written before about the rigid inspection process that each PCB, cable harness, wire-wrap board, etc., was put through. Many of the assemblies for use in underwater vehicles and ship-based controllers needed to be conformably coated for protection against the corrosive salt water environment. The first step was usually thorough cleaning in a heated ultrasonic bath of methyl chloroform (aka 1,1,1-trichloroethane, no citrus-based cleaners in those days), which not only removed every trace of solder flux (from -- gasp -- 60/40 PbSn solder), but left properly flowed solder joints shining like a polished chrome bumper (back when cars had chrome bumpers). Next, the boards were baked in an oven for a prescribed number of hours, then we dunked them in the conformal coating solution and baked them again. We were a very low volume production outfit that rarely made more than 10-12 of anything, so everything was done manually. HumiSeal Div., Columbia Technical Corp. The author received his engineering degree from the University of London in 1939. 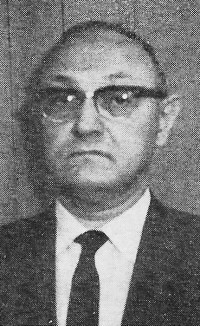 Shortly after his service in the U.S. Army in World War II, he co-founded Columbia Technical Corp. of which he is a Director and the Vice President. He was General Manager of its electronic-components division until 1966 and now manages its HumiSeal Div., which manufactures conformal coatings for the electronics industry. He is a member of the IEEE and a Lt. Col. in the Reserves. Providing a barrier against humidity, abrasion, solvents, and fungus is the job of the coating. Used on just about all military PC boards, these coatings are gaining acceptance in both industrial and consumer products. The greatest deterrents to the proper functioning of a PC board assembly are the environmental stresses under which it is to operate. Humidity is generally recognized as the principal culprit, as the military learned from bitter experience on jungle battlefields stretching from the Pacific Islands to Vietnam. While other environmental stresses, such as dust, shock, vibration, and temperature extremes, may affect the performance of a PC board, humidity, especially when under high temperatures, will invariably degrade its electrical performance and eventually lead to ultimate failure. Humidity will, for instance, drastically lower the insulation resistance between printed conductors, cause arcing, corrode conductors, and stimulate fungus growth. A barrier against environmental stresses was therefore needed, hence, the emergence of conformal coatings. These I have become a must on all military electronic PC boards and are steadily gaining acceptance in industrial and consumer electronic systems. A coating must, first of all, constitute a barrier to protect the board and its components against harmful environmental effects. In addition, it must also satisfy many other frequently conflicting prerequisites. It must be hard enough to withstand abrasion and marring, but flexible enough to withstand temperature shock or flexing without tearing. It must be viscous enough to build up an adequate film thickness, but thin enough to flow under and around closely mounted components. It must be easy to handle and apply, be economical, have a long pot life, be non-toxic, have a wide operating temperature range, a low water-vapor permeability, and have many other desirable characteristics. Needless to say, such an ideal coating does not exist nor is likely to ever be formulated. Therefore, we must trade off one characteristic for another and concentrate on those which are really essential to assure reliability of performance under those particular environmental conditions specified for the equipment. This may be a difficult task indeed. The number of coatings of every description now available is overwhelming; however, only a relative few are suited for electronic applications. It would be unwise for the packaging engineer to consult a resin manufacturer directly, rather he should turn for assistance to coating manufacturers who specialize in materials suitable for electrical and electronic applications. Such manufacturers usually have a selected line of coatings which have been carefully formulated to offer those mechanical, electrical, and chemical characteristics that are most desirable. Their printed data is generally directed to the electronic engineer and contains extensive information from which he can determine if a particular coating meets his specific requirements. Generally speaking, most conformal coatings used for coating PC boards are formulations based primarily on epoxy, polyurethane, or acrylic resins and, to a lesser extent, on polystyrene, diallyl phthalate, silicone, and polyimide resins. Many variations within each chemical group are made possible through the addition of various chemicals which enhance some particular characteristic of the coating, sometimes at the expense of another. 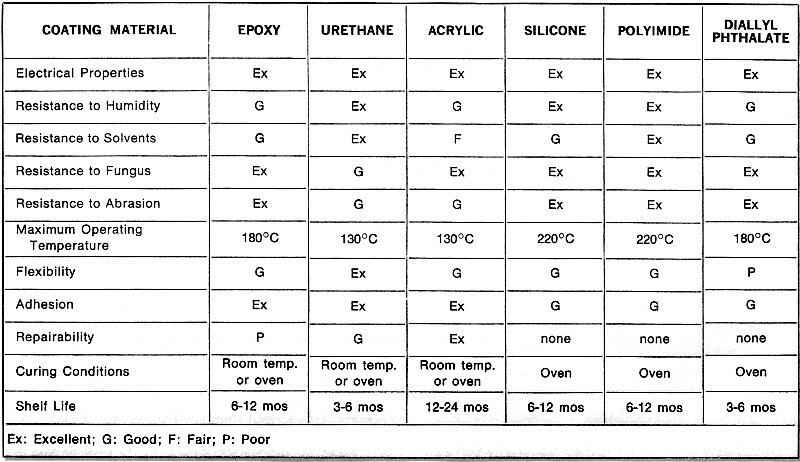 Table 1 gives a comparison of the average group characteristics of PC board coatings most frequently employed. Before a board is coated, it must first be thoroughly dried and cleansed of all extraneous materials, such as solder flux, mold release, oil, dust, fingerprints, and moisture. A clean and dry board is one prerequisite which will govern the effectiveness of the coating; its importance cannot be overemphasized. A good work flow plan will usually specify several successive washing and drying operations before a board is submitted to actual coating. Many of the customary cleansing methods may be used: vapor degreasing, ultrasonic cleaning, or washing in trichloroethane, Freon, or other similar solvents. Cleansing is followed by a period of forced drying to remove all traces of solvent or moisture. The board should then be protected from further contamination until it receives its first application of protective coating. Sharp edges, corners, and ridges are the most difficult to coat, as coatings have a tendency to flow away from them. These should be rounded off, if possible eliminated entirely. Leads sticking out prominently beyond the board are particularly unreceptive to coating; they should either be bent or clipped short. Areas of the board which should be free of coating are usually masked off. Flat areas, such as contact fingers or slides, and tunable components are covered with masking tape; cavities, such as test jacks, are plugged with a toothpick or a tapered pin of suitable size. Table 1. Comparative characteristics of commonly used coating materials used for printed-circuit boards. Coatings may be applied by brushing, dipping, spraying, screening, or flowing. Of these, dipping and spraying are most frequently used in production; both methods are quite readily adaptable to either manual or automatic methods of operation. Dip coating is the most reliable method since it assures that a board is totally covered with coating material. The angle and speed of immersion and withdrawal are important and must be optimized to avoid air bubbles and allow coating to flow freely and uniformly. Speeds of withdrawal are usually on the order of 2 to 4 feet per minute. The viscosity of the coating must be monitored and closely maintained by gradual addition of solvents, otherwise the coating thickness and penetration under and around components will be greatly affected. Spraying can be accomplished with conventional low-pressure spraying equipment. In a manual operation, a certain degree of skill is required of the operator to assure thorough coverage and uniformity. Here again, both in a manual or an automatic operation, viscosity has to be maintained at a constant level. Following the dipping or spraying operation, the boards are allowed to dry in a dust-free area, either at room temperature or in ovens, depending on the materials that are used. Most coatings will be dry to handle in under one hour at room temperature; this could be expedited by exposure to moderate heat. A dry film, however, does not necessarily mean that it is fully cured and has reached its optimum properties. Full cure for most coatings requires heat, but some others will cure by exposure to oxygen, or to ambient moisture. It is a good practice to apply two or three successive layers of coating to a board as this will minimize the possibility of pinholes which would provide a path for the ingress of moisture. A total build of 1 to 3 mils is usually an adequate film thickness for most purposes. The thickness of the film can be controlled by thinning down the liquid coating with an adequate solvent. MIL-I-46058B specifies the requirements for electrical insulating compounds for coating printed-circuit assemblies. 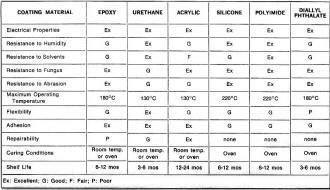 This specification classifies coatings in four groups: epoxies, polyurethanes, silicones, and polystyrenes. Acrylic coatings, although widely used, are not included at the present time. Testing under this specification is primarily electrical at steady state as well as under environmental conditions, such as humidity, temperature extremes, and immersion in water. Other tests evaluate the coating for flexibility, resistance to fungus, and thermal shock. Electrical tests are performed on specimen PC boards consisting of two parallel conductors 1-inch long by 0.030-inch wide, laid 0.030-inch apart. The coating applied must have a thickness of 2 ± 0.5 mils. The U.S. Army Electronics Command maintains a Qualified Product List (QPL) of products which have been qualified under the requirements of this particular military specification. Whether a coating is qualified under this specification or not, it is still desirable, if not mandatory, that it be evaluated in the system in which it is intended to be used. It must be remembered that qualification of a product under this specification is performed under ideal laboratory conditions and with specimen boards that are flat and devoid of components. Results obtained in testing production boards may be, and usually are, substantially lower than the minimum requirements established in this specification. Hence, the necessity to ascertain that the minimum requirements of the system are also met.